Randal M Woodard has been located and is safe. The Adams County Sheriff’s Office seeks your help in locating a missing person: Randal M Woodard, (58 Years Old, 5’ 08” 222 LBS) Last seen in the City of Adams, WI on Thursday, 08-03-2017. Randal had appointments of Friday, 8-4-2017 in which he did not arrived. 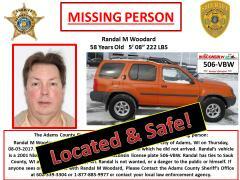 Randal’s vehicle is a 2001 Nissan Xterra, Orange in color with Wisconsin license plate 506-VBW. Randal has ties to Sauk County, WI and Milwaukee County, WI. Randal is not wanted, or a danger to the public or himself. If anyone sees or has contact with Randal M Woodard, Please Contact the Adams County Sheriff’s Office at 608-339-3304 or 1-877-885-9977 or contact your local law enforcement agency. Randal is not wanted, or a danger to the public or himself. If anyone sees or has contact with Randal M Woodard, Please Contact the Adams County Sheriff’s Office at 608-339-3304 or 1-877-885-9977 or contact your local law enforcement agency.